In the last few days more news surrounding the current helium shortage is being released. I was reminded of this story in my local newspaper. “Helium shortage deflates grad parties” – Omaha World-Herald, May 22, 2012. 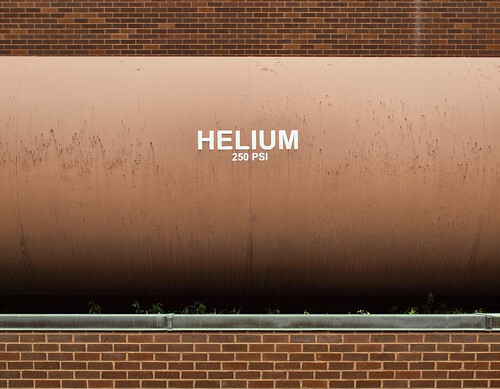 The problems began when the federal government enacted a cost-cutting law in 1996 and began selling off reserves of helium stored underground in a huge oil field in Oklahoma, Texas and Kansas. The intent was good, but the law set the price so low that it discouraged new production or efforts to find new helium-rich natural gas deposits. Congress is considering a measure to correct the pricing problem, but it will take time to rekindle the domestic market. Even then, the world eventually will have to learn to live without it: Some experts think the world supply will float away in 30 years, others say 80 years. Once it escapes to the air, helium can’t be recovered. The warm 2011-2012 winter and low market price of natural gas and helium reduced potential profits from gathering helium. The result is a shortage that affects Nobbies, Mangelsen’s, Hy-Vee, Walmart and other retailers who carry the balloons that usually bob around graduation parties each spring. “You definitely want to keep the medical industry running and the industrial uses running ahead of the balloons,” said Wayne Grabel, manager of the Matheson-Linweld gas supply branch in Omaha. “What supply there is of balloon-grade helium is slowly drying up. People are not getting replenished the way we’d like. The Nebraska Medical Center, Methodist Hospital and Alegent Health hospitals have normal supplies, officials at the hospitals said. Nebraska Medical Center spokesman Paul Baltes said the hospital, which has a long-term contract, uses helium gas for some surgeries and liquid helium to cool its magnetoencephalograph, or MEG, scanner, a diagnostic tool used mostly for epilepsy and pre-surgical patients. Alegent uses helium for a mechanical device known as an intra-aortic balloon pump, which increases oxygen for cardiac patients, spokeswoman Jodi Hoatson said. Welders of stainless steel use helium, and the Midlands’ food industry requires stainless steel equipment that can be cleaned quickly and thoroughly. Millard Manufacturing makes stainless steel platforms, tanks, conveyor systems and other equipment for ConAgra Foods, Tyson Foods, Cargill Meats and other food processors. In addition, some laboratory methods and instruments require helium to perform analysis. We are watching this story very carefully. As you can see, the problem has taken a number of years to get to this point, but hopefully some action will be taken on this particular issue very soon.